Today is the day to pull the hardtop out of storage, and haul it up to my main shop 15 miles away and get started on it. Will post pix and keep this thread as the main project thread as the car comes together. The vision is a low sitting, good handling, fun to drive, 500 hp LT1 396 with a T56 and 9" locker, minitubbed with good rubber all around. When I bought it, the motor was a wheezy, oil leakin' 350/350 combo, on stock rims with stock suspension, stock interior, and the magnet found a bit of bondo here and there. There are lots of decisions to be made, bucket seats vs the bench. Dechroming vs keeping the Bel Air trim. Just how far do I want to go with the frame. Have visited both Jim Meyer's shop and Art Morrison's shop, both offer quality products. Or do a body off and setup my own custom frame (a whole lot more work, but I feel capable of doing it). It's just that as I turn 71, just how far do I want to go with this car? The motor is built and ready to go. Needs a new water pump is about all. my stock LT1 seems pretty strong. no tellin' what that beast will do. Niice! Looks like a good start already Willy. I'll be keeping up with this one too. i would leave the body and stance much as it is.now the engine and trans--go for it. I too like the stance, and the current color scheme. Old school on the outside, and new school power train; that would be a winner in my book. Butch/56sedandelivery. Towed 'er up to the main shop I share with a couple of buddies yesterday. There are five other project cars in that shop at the moment. I have on hand a pair of Global West tubular a-arms, with coil-overs, 2" dropped spindles, disk brakes, to install. That will drop the front end a little, I've always liked a little rake on them like was popular "back in the day...."
At our "fender friday" beer and grill session at the shop last nite, we were all talking about "what if" for this car, and ya know, I kinda like the current color scheme! Am thinking along those lines right now. There is some rust along the lower door panels, and some of the rear floor needs repair or replacement, might need new door panels. Will be pulling off all the old paint and finding where the bondo is. looking forward to the build updates. FWIW, I like the color it was when you stored it. Yeah, I'm leaning more and more in that direction myself. I do like the subtle nuance a nicely done clear coat with some pearl in it can do to the white portion. Have seen some that I really liked! The side trim is banged slightly here and there, but generally in pretty good shape! The white paint down the center of the main piece looks like original, and showing it's age, but am thinking it looks pretty cool actually, and leaving it just the way it is, just polishing the stainless a little, would be a cool way to go! Will show some pix when I get a chance. Still need to weld in the rear tubs, hauled them, the hood and trunk, an AAW wiring kit, the Global West front suspension setup with 2" dropped spindles and disk brakes up to the shop yesterday. I'm glad I did, as now it would be impossible to pick up the parts I used in both the trucks, the gasser, and now this cruiser! This might be my last project, ya just never know. Went to a funeral Fri for a 79 year old buddy who was drag racing his 10 second camaro up until he was 75, and had just put the finishing touches on his '37 Ford pickup, wish I had pix of that truck, it is stunning! I used to sit in the staging lanes in my '58 pro street truck (12.90 class) next to his camaro which was lined up in the 10.90 class, and be inspired to be like him! He fought cancer these last 4 years and it finally got him, but he never gave up! There are plenty red and green ones out there. No need to add another one. Besides, the truck is red. Put a black stripe on it. Depends on what you want! Do you want a 'In your face mess with me and I'll blow your doors off' ride? Then the red with black stripe. If you want that nice street car "sleeper" look with some gitty-up under the hood, then keep it the same color. I'm not exactly sure that is a stock color. It looks a lot like my car color and it is not a stock color. It's a nice color, metallic? It's slightly metallic, I'll get the cowl tag info and figure out what it was originally. The dash is a really dark green, I don't like it. I like the color it is a lot though, so might just keep it that way. To me it looks really good just the way it is, needs to sit just a hair lower though for me. 2" would be plenty! Goin' through my storage room, sorting through parts I have accumulated for various projects, and left over parts from "finished" projects (come on now, ya know they are never "finished"....), there are some parts I just can't find. They are hiding from me! I know I had a complete Global West front suspension setup for this car, tubular a-arms, 2" dropped spindles, disk brakes, have found everything but the spindles, should have been there with the other parts, but nope! Can't find 'em! Willy I usually find the parts I couldn't find after I bought the second set! Anybody know how to interpret these? Not sure what Top ACC means. I'm sure someone else will chime in with the info. Am still up in the air as to what color I want to go with this car. Just cleaning up, checking parts, searching for "lost" parts (well, I know I had 'em, so where are they??? ), and have found most of them. started putting the Heidt's front suspension together on the work bench to check out if everything was there: tubular a-arms, 2" dropped spindles, disk brakes, QA1 coil-overs, it's all looking good! The front suspension parts are in good shape, just need a cleanup, some new bushings and some fresh paint. 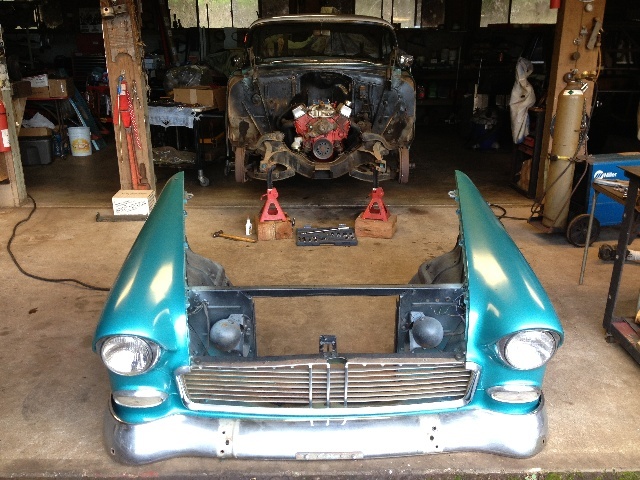 Think anyone doing a tri-five resto might be interested in them? The front end parts probably aren't worth the shipping costs to send them. On mine I lift the body off the frame about six inches, replace the bushings and paint the top of the frame. I don't have the room or the gear to take the body completely off the frame and would rather not do it if I don't need to. Edited by 2Loose on 02-11-13 11:04 PM. Reason for edit: No reason given. The autocross deal is actually pretty fun. I don't think you will need a roll bar for most courses as they are generally pretty short straight sections between corners. I have run the '56 at Del Mar Goodguys two years in a row and it's all first and second gear, mostly first with my gearing and set up. In your other post about steering boxes, I'll second the CPP 500 box. I installed mine when they first came out and along with all the other suspension stuff like you are planning it will work great. Also, those pics of the OD shop are great!